Modern Eugene might be light years away from traditional cowboy archetypes, but Oregon holds a rich history of John Ford-esque characters and tales that the Oregon Folklife Network is tapping into. The network is presenting “Buckaroo Traditions of Oregon,” an exhibit showcasing stories of cowboys in the Beaver State. The exhibit will be housed in the Oregon Folklife Network office on the second floor of the Knight Library. It is currently open to the public and will run until July 31. The exhibit traces the history of the buckaroo, an anglicized version of “vaquero,” the word for a Mexican horseman or cattle rancher. 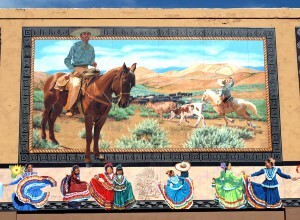 Vaqueros originally moved into Oregon around the 1850s and soon groups of settlers from Germany, France, Spain and other European nations adopted the vaquero lifestyle, developing the mold for the buckaroos. The exhibit will display handcrafted buckaroo gear, including tooled leatherwork and “mecates,” or ropes. “I want visitors to learn more about a tradition which comes from diverse cultural contexts and ended up here in Oregon,” exhibit curator Adrienne Decker said. For more information on buckaroos, visit the exhibit website.